“But this new library is scary. 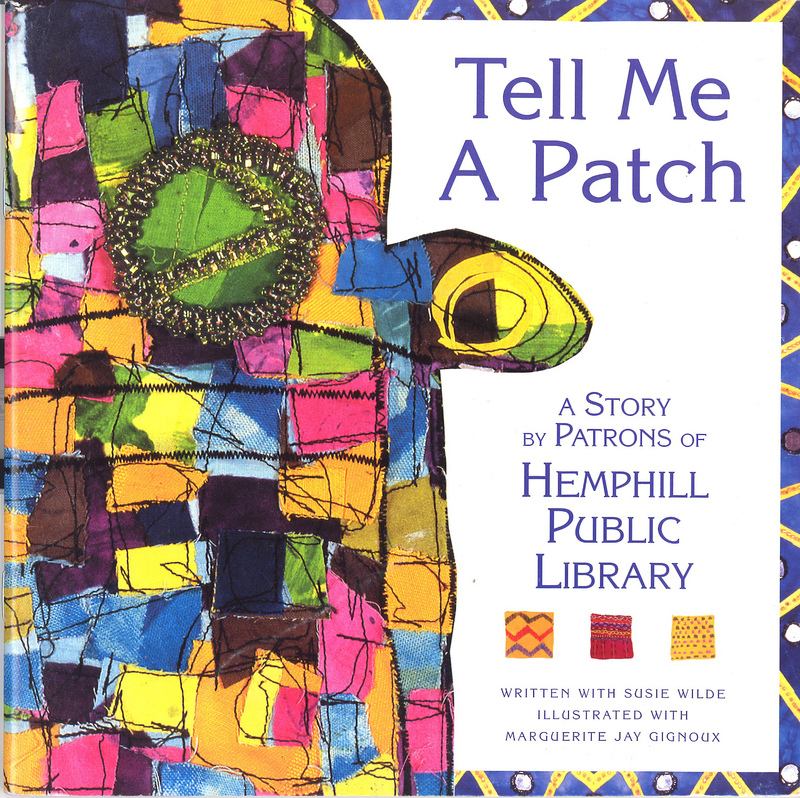 Please, tell me a patch!” begged Zigzag, his voice as nervous as a book waiting for its first check-out. “Yes, that one!” Zigzag nestled into Mahogany’s padding and gazed at a faded square on her left arm. “Far away in a land where the sands gleam gold and shimmer under the heat of constant sun, there once lived a family who loved me when I was a new chair….” As usual, before Mahogany finished, her soft words had calmed Zigzag’s fears. Mahogany’s wood bore the scars of traveling the world for thirty years and her fabric had been torn and mended so many times, she could hardly remember her original covering. She didn’t fit in this freshly-painted library where every stick of furniture looked as if it had just come from the factory. All the other chairs were new and bright. In the main room, the colorful Skinny Mini chairs gathered around Click and the other computers. The Pine Sisters crowded close to the low tables in the children’s room and Willow, a rocking chair, stood next to her stool, Rosewood. Their modern fabrics and shining woods made Mahogany feel as worn out as an old paperback. Like most humans Mr. Libros knew nothing about the language of furniture or how they came alive at night. Even so, Mahogany was surprised that he couldn’t hear the constant racket. “Can’t wait till tonight,” Shady, a proud lamp with a wide brim, whispered to a book shelf while the Pine Sisters chattered about cartwheels. Mahogany would never tell Zigzag, but she was worried about they’d fit in with this rowdy furniture. At nine o’clock, Mahogany heard the squeak of Mr. Libro’s sneakers fade and the library lights went out for the night. Minutes later Shady’s light snapped on. Skinny Mini I, II, III and IV chorused, “Ready,set, go!” and scampered around in a game of chair tag. Tables leapfrogged through the aisles. The Pine Sisters squealed and cart-wheeled between bookshelves. “What’s going on?” Zigzag asked, trembling. Before Mahogany could say a word, Shady hopped over. “Don’t get your feathers ruffled, you silly pillow! Look at those guys, they’re having a great time.” She pointed at two pillows whacking each other at the far end of the room. “I-I-I don’t want to,” Zigzag said. Shady beamed her light right into the pillow’s face. “Furniture that doesn’t want to have fun?” She flicked her switch twice in disgust and jumped to where two waste baskets were tossing balled up scraps of paper. 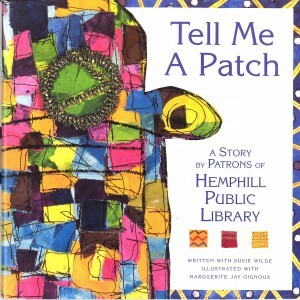 “Tell me a patch. Now! ” Mahogany could feel the pillow’s small heart pounding. “See this woven material on my right shoulder? ” she said. “When I was so young that my wood still smelled like the forest, I lived in Guatemala, a land of mountains and bird song…” Moments later Mahogany felt Zigzag relax. By the story’s end he had quieted enough to get some sleep. She was just dozing off herself when Shady slammed into her side, waking Zigzag who took shelter against Mahogany’s shabby arm. “Look, Shady, in case you haven’t noticed I’m a creaky old chair and Zigzag’s kind of timid. Can’t you leave us alone?” Mahogany said. “It’s almost dawn and your fun time is over!” Mahogany said. “Just wait till later,” sneered Shady. Mahogany thought a lot about Shady’s threat as the children’s room hustled and bustled all day long. Just before the library closed, the sky filled with black clouds. The wind shrieked, the trees swayed and the leaves began a frantic dance. Mahogany sighed. As the library closed, rain drummed on the roof. The wind rose and the Pine Sisters began howling. The usually joyful Willow was weeping. Click beeped and downloaded blaring Techno music. Shady flashed like a strobe light and the Skinny Minis boogied to the beat. The tables stacked themselves until they reached the ceiling and Rosewood rattled the front door trying to escape. There was a crash of thunder, a flash of lightning, and the lights went out, plunging the library into a darkness as black as the bottom of a book return bin and just as quiet. “We’re scared. We don’t like the dark,” whimpered the Pine Sisters. “I-I-I’m afraid to move,” Rosewood shivered. “Our legs are trembling!” cried the Skinny Minis in a chorus. “Come on, you guys, pull yourselves together!” Shady’s words were brave, but her bulb was out and her voice shook. A jagged line of lightning tore through the sky, catching a mirrored patch on Mahogany’s side so that it flashed and glittered. The furniture drew closer to the twinkling fabric, surrounding Mahogany. “Tell us the mirror patch,” Zigzag said. As the storm raged outside, everyone huddled together against the darkness. When the Pine Sisters giggled, Shady whispered, “Hush up you chairs! Mahogany’s trying to tell a story.” The lamp crept even closer to the old chair. Mahogany’s voice had a power as strong as any light. The lamp sighed, Zigzag snuggled and Mahogany imagined the story she’d tell about finding a home at this new library.